Rating: ★★★★★ Moving, thought-provoking exploration of animal uplift. 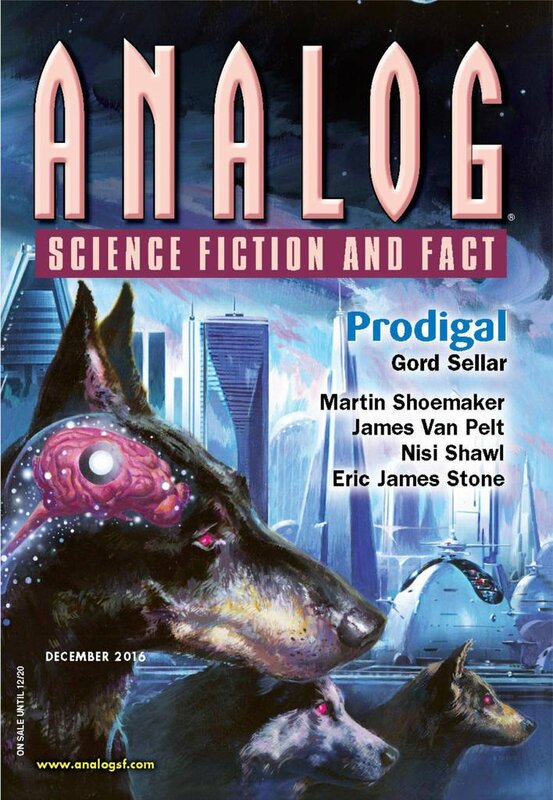 "Prodigal," by Gord Sellar [bio] (edited by Trevor Quachri), appeared in Analog Science Fiction and Fact issue 12|16, published on October 27, 2016 by Penny Publications. Pro: The surface story is fine; Benji discovers he's a second-class citizen, rebels, and loses his family over it. But as a metaphor for losing a loved one to a cause, it's dynamite. We sympathize both with the narrator and with Benji. The narrator and his family really loved Benji, and, for a while, at least, he loved them too. We feel their pain at losing him and watching his love turn to hatred. But Benji is in a worse position than any slave ever was. He may be mentally uplifted, but physically, he and others like him will always be at a serious disadvantage. Add to that a society that still puts down stray dogs, uplifted or not, and Benji has good reason to be angry. Con: The visit from the police dogs was hard to take seriously. I rate it ★★★★, one less than RSR. It's a well-written story with emotional punch, but even though I enjoyed the "what-if" where dogs are uplifted, the light-hearted tone (many doggie adaptions like a smell-o-vision dog channel, scooters and equipment for sentient police dogs) mixed with a serious matter like terrorism and the unsatisfying ending kept me from putting it on my Hugo nominations. I wanted to like this more than I did. The premise is intriguing, but the result is so heart-breaking. And there's just too much contrast between the tragedy and the silliness. It's definitely a challenge to include comic relief without ruining a story. Worst is when they start off as humor but end up very dark. I thought this one managed to balance it pretty well--except for the police dogs. This was certainly worth the time - an interesting idea and I liked that the story got down to business straight away. As with Laura, I did feel that some of the imagery was throwing the tone off - the circle of dogs being harangued made me think Animal Farm - and the police dogs were a step too far, but elsewhere the story was very well done. I discovered a while back that if I insisted on stories being perfect, I'd end up recommending only two or three a year--if that. :-) It all comes down to how much you can tolerate, and that's likely to vary a lot by person. Even then, a technically perfect story can still flop just by being uninteresting.